Nothing lingers like the smell of cigarette smoke. It sticks around in the air and clings to the ceilings, walls and floors no matter how many candles you light or how much air freshener you spray. Ridding your house of the smell of cigarettes can seem like an insurmountable task, but with the use of the right methods, you will be breathing clean air in your home in no time. Here are a few tips and some of the best ways to get rid of cigarette smoke. If you are renting, it is important to refer to your lease to determine what your rights and responsibilities are. Often, the landlord is responsible for getting rid of the smell and footing the bill. If this is the case with your lease, getting rid of the smoke smell in your new apartment or house is as easy as calling your landlord so he or she can make arrangements for professional cleaning services. On the other hand, if you own your house or are otherwise personally responsible for getting rid of the odor, then it’s time to roll up your sleeves and get to work. You may have already tried quick fix remedies such as lighting candles or using air fresheners. While these do a great job of temporarily masking the lingering smell of cigarettes, they don’t actually get rid of it. No matter how many candles you light, the smell of cigarettes doesn’t go away for good without some serious elbow grease. This means cleaning- and a lot of it. The smell of cigarettes doesn’t just linger in the air. It sticks around everywhere. To banish cigarette smoke from your home once and for all, you need to break out the cleaning products and start scrubbing. The first step is to get as much fresh air into your home as possible. This begins by opening all of your windows, and letting nature work in your favor. While this won’t completely get rid of the smell, it is the best way to get started. Another excellent way to clean the air in your home is to use an air purifier. An air purifier works by drawing polluted air into the unit, trapping any allergens and contaminants in its filter. Place the air purifier in the room that you use the most, such as a bedroom or the living room. The unit should be left on continuously to ensure that the air is kept clean at all times. This is a very effective way to decrease the smell of smoke in your home. By opening your windows and using an air filter, you are on the path to clean air. When cleaning, many people scrub the walls but tend to neglect the ceiling. It is important not to make this mistake, because your ceilings are much more likely to retain smoke. In order to completely rid your home of the smell of cigarette smoke, you need to thoroughly clean both the walls and ceiling. Make sure that you use cleaning products with ammonia and glycol, both of which are key ingredients in neutralizing smoke odor. It is also important to keep children and pets away while you are using these chemicals. Start with a test area to make sure that the cleaner is safe for your paint and then go one room at a time, thoroughly scrubbing every ceiling and wall. If the smell of smoke still lingers afterward, you may need to consider repainting your walls. Consult a paint or hardware store to find a sealant that can ensure the smell of smoke doesn’t seep through the new paint. Cigarette odor also sticks around in your floors, whether you have carpeting or hardwood floors. For carpet, you may want to start by cleaning it yourself. Use a carpet cleaner, generously sprinkling every carpeted room. Let the cleaner sit for its maximum recommended time before vacuuming thoroughly. If the smell still lingers, you should consider having your carpeting professionally deep cleaned. For hardwood floors, make sure that you mop thoroughly, changing the water in your mop bucket regularly. By now, your home should be smelling noticeably better. However, there is more work to be done, especially if you can still smell the lingering odor of smoke. The next step is to clean your drapes and blinds using a touch of vinegar. Make sure to consult the manufacturer’s cleaning instructions before you wash your drapes. Next, clean your windows and mirrors with a solution of vinegar and water. If you still smell smoke, try cleaning your furniture and getting rid of any clothes that retain the smell. After all your hard work, you can relax in the splendor of a clean, sweet-smelling home. 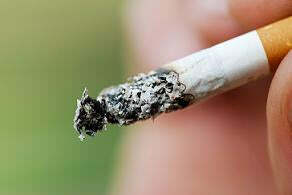 Although the dangers of long-term exposure to secondhand smoke are well known, a study conducted by the University of Athens and the Hellenic Cancer Society in Greece, and the Harvard School of Public Health found that short term exposure to high concentrations of secondhand smoke, as little as 20 minutes, can cause immediate impairment of airways. Researchers exposed healthy adults to a concentration of secondhand smoke designed to mimic the levels found in bars or during a car ride with a smoker present. Although none of the participants in the study reported feeling negative effects, when their breathing was measured it was found that the exposure was in fact “invoking such physiologic changes as increased airway impedance and resistance.” This new research will help public health workers more thoroughly understand the risks and consequences of secondhand smoke in public places, and will add to the growing body of data about the effects of secondhand smoke. While the best way to protect oneself from secondhand smoke is to avoid it altogether, for many people, this is not always possible. Smoke can easily drift into workplaces from the street, or into homes from neighbors nearby. Secondhand smoke is difficult to deal with, but there are a few steps you can take to help protect yourself if controlling the smoke at the source is not an option. Stopping the smoke from entering is the first defense, and sealing not only windows and doors, but even electrical outlets can help to block the smoke from coming inside. Operating an efficient ventilation system can also keep your indoor air clear. For the smoke that does make it inside, using an air purifier, such as our MinusA2, that combines a true HEPA filter with a charcoal based activated carbon filter can help to filter out the chemicals and odors from secondhand smoke.